IBEROSTAR Hotels & Resorts, along with Apple Vacations, will partner with several notable American sports teams this year, including the Philadelphia Phillies, Chicago White Sox, and Indiana Colts to bring unique and engaging activities to travel agents and consumers in key source markets. As IBEROSTAR Hotels & Resorts continues to spotlight its newest addition its portfolio in Playa Mita, Mexico, a recent AAA Four Diamond recipient— its longstanding relationship with travel industry powerhouse Apple Vacations is ever more critical to bolster awareness and sales. The partnership with this iconic baseball team includes the sponsorship of three games (May 27, August 19, and September 9). Moreover, on each game day, there will be a Baseball 101 Clinic, which will include on the field training. In addition, there will be a press conference with a special guest speaker, a Q&A session, and an Apple Vacations/ IBEROSTAR presentation. Prior to each game, IBEROSTAR and Apple Vacations will host an agent tent party, where agents will receive tickets to the game and exclusive VIP suite access. Live from the baseball mound, a representative for the brand will kick off the games with a ceremonial first. Continuing the brand’s dedication to charitable endeavours and ensuring the partnership goes beyond the baseball field, IBEROSTAR Hotels & Resorts will be supporting five charities associated with the Philadelphia Phillies, listed below. An exciting ceremonial first pitch along with an exclusive travel agent event with a VIP Suite, will commence the sponsorship with the Chicago White Sox. In addition to the in-game promotion on the stadium’s LED boards and scoreboard signage, the June 12th game event will also include seat upgrade promotion for baseball fans. The yearlong partnership with the Indianapolis Colts will involve several marketing and promotional activities such as stadium exposure throughout the season. What’s more, there will be an on-location photo shoot for the Indianapolis Colts Cheerleaders annual calendar at the award-winning IBEROSTAR Playa Mita in Riviera Nayarit, Mexico. The cheerleaders will also take strides down the catwalk in an exclusive fashion show at the new AAA Four Diamond property. Lucky guests staying at the resort from June 3-10, 2014 will have a chance to interact with the cheerleaders during their stay. Additionally, at an upcoming Colts home game, there will also be an agent event. IBEROSTAR Hotels & Resorts is a family-owned Spanish hospitality company with more than 50 years of experience in the travel industry. IBEROSTAR provides unique vacation experiences, rooted in superior customer service and quality, in the world’s most popular vacation destinations. With around 100 hotels in 13 countries, IBEROSTAR Hotels & Resorts is committed to offering excellence in quality and service and providing personal attention to each guest. For 45 years, Apple Vacations, America's Favorite Vacation Company, has provided affordable, top quality vacation packages from U.S. departure cities nationwide to vacation destinations throughout Mexico, the Caribbean, Central America, Hawaii and Europe, as well top U.S. and Canadian ski resorts. With the support of travel agents, Apple Vacations has delivered more passengers to Mexico and the Dominican Republic than any other North American tour operator. Apple Vacations is consistently voted "Best Tour Operator to Mexico and Latin America" by readers of the leading travel trade magazines. Many of us could celebrate doughnut day every day, but June 8 is THE day to eat a doughnut, as it is Jelly-Filled Doughnut Day. Delightful Pastries has doughnuts filled with jelly every way you could imagine. Paczki doughnuts ($2-2.50) are a must have for any doughnut lover, filled with the assorted flavors of plum jelly, raspberry jelly and custard. If you need something to help kick start your day, try the boozy versions of the Paczki ($3.25), filled with whiskey, moonshine or vodka; they are a sure way make your day a little more memorable. If a liquor filled doughnut is a bit too adventurous, instead go for Delightful Pastries’ masterful Danish ($2.50), an all-butter sweet dough filled with cherries, cheese, apricot, apple or raspberry or try a Blueberry Turnover ($1.70), a flaky puff pastry with Michigan blueberries. And while you’re at it, enjoy yourself as you browse the wide range of breads, pastries, cookies, cakes, brownies and savory delights that have made Delightful Pastries one of the most beloved bakeries in the Chicago area. The Jelly-Filled Doughnuts and other pastry and dessert items can be found at all three Delightful Pastries locations: Old Town at 1710 N. Wells St., (312) 255-0724; Jefferson Park at 5927 W. Lawrence, (773) 545-7215, and Chicago French Market at 131 N. Clinton, (312) 234-9644. Visit http://www.delightfulpastries.com for more information. You can also find Delightful Pastries at Outdoors Markets All Summer Long! After being cooped up all winter, it is time to get outside and celebrate summer with Delightful Pastries. Delightful Pastries is hitting the streets and will be seen all over town at local Farmer’s Markets. Beat the heat with chilled desserts and drinks, as well as Delightful Pastries’ popular pierogi and delicious sandwiches on croissants made with real butter, all being sold across town at different markets. 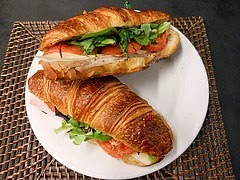 Grab lunch while shopping and enjoy Delightful Pastries Thanksgiving, Polish or Big Fish sandwich. You can find Delightful Pastries at Argyle Night Market, Lincoln Square Market, Daley Plaza Market, Division Street Market and Independence Park Market this summer, so keep your eyes peeled for them…your sweet tooth will thank you. specializes in contemporary paintings, works on paper, fiber art, sculpture and photography. Featuring Chicago based artists, as well as internationally known artists from Europe, and the Mediterranean Region such as Turkey, Greece, Italy, and the Middle East. Located in the River North Art District, the gallery is at the corner of Wells and Superior. "I call this work "IMPASTO" because of the way the negative is processed. Normally the developing is Zen-like, with flawless agitation, perfect temperature, timing to the second and fresh chemicals. This is opposite with an unholy mixture of chemicals, thrown into the negative irreverently, sometimes with a vengeance. The result is a more interpretive look." BUTTERFLIES & BUFFALO PART II: AN AMERICA PORTRAIT is the second exhibition in this photographic series by Dennis Manarchy, voted one of the top 100 photographers in the world. GHOSTRIDERS, PART I, which opened last September was only the prelude to Manarchy's vision of building the world's largest film camera. Join us on June 13 to view not only the photographs of authentic American cultures, but see the camera and genius behind the building of what is in today's technologically advanced world a vanishing process. An enigma in today's digital world, the camera's classic construction and unprecedented 6-foot film negatives are a tribute to a fading era in photography as we approach the 200th anniversary of the camera. Despite its traditional design and function, the camera is capable of producing images with over 1000x more detail than today's most advanced digital cameras. Resulting exhibition prints will be breathtaking 24-foot portraits with detail never before seen in photography. More importantly, they will provide an indelible glimpse into the history, achievements, struggles, and environments of these extraordinary people and their unknown worlds. British teenagers stay an average of 22ft away from their dads in public, according to a poll of teens carried out by occasions specialists and card retailer Clinton’s. The poll of more than 500 teenagers found that they favoured this exclusion zone for fear of being seen by friends in public with their dads. The poll also found that the average dad does 627 ‘dad miles’ per year on weekends, ferrying teens to and from parties and other social gatherings, often very late into the evening. One West London dad of four, Jeremy Duncan, said that he had taken to answering the phone “Duncan’s Taxis” after 10pm on Friday and Saturday nights in the certain knowledge that it would be a request for a lift from one of his teenage kids. Jeremy Duncan said: “I have noticed that my teenage kids tend to keep their distance when we’re out and about. I don’t take personally because I remember doing it myself from time to time, as we all do. Maybe Father’s Day should be the one day in the year when we agree a bit of a temporary truce and call a halt to No Dads Land in public." Britain’s long-suffering dads fall well behind mums in the thank you stakes as well. Market data from the UK Greeting Card Association reveals that 22 million Father’s Day cards were sent in 2013, less than half the number sent to mothers on Mother’s Day. Clinton’s is calling on teens to redress the balance this year and thank their dads for the long-suffering contributions that they make to their kids’ upbringing. Unlike Mother’s Day, Father’s Day does not have official church recognition and the tradition is a relatively new one, compared with Mother’s Day. The tradition of Father’s Day started in the US at the start of the 20thcentury. The idea spread to the UK with the American GIs based here during World War Two, and it was after the war that the idea really caught on here in the UK. The tradition was started by Mrs John Bruce of Spokane in Washington State, who wanted to pay tribute to her own father, who had raised her and five siblings after the death of her mother. She asked her local church for a special sermon on the goodness and devotion of fathers and was so inspired by it, that she drew up a petition asking for the third Sunday in June to be a special day for honouring fathers. In 1910 her wish was granted when Woodrow Wilson officially designated the day as Father’s Day and chose a rose as its official symbol. Today millions of sons and daughters around the world remember their fathers on Father’s Day.